Looking for a calm holiday but still want a lively nightlife within easy reach?, your holiday is here. Maspalomas is a green oasis just above the magnificent desert area midway between sandy beaches of Playa de Maspalomas and Playa del Inglés. Maspalomas is a fairly well designed resort with mostly low rise hotel buildings. Much revolves around the beach of course. Five kilometres long, wide and gently stretching all the way to Playa del Inglés – so there is plenty of room for all visitors. Families with children tend to keep along the well-managed beach strip at the lighthouse, where there are sunbeds, umbrellas, water activities and restaurants. Others choose to extend their towels between the dunes, or simply walk along the shoreline. Maspalomas has become a favorite destination for families with children, especially because the pace is relaxed and yet there are plenty of activities for both adults and children. The Adventure Aqua Sur attraction for example with water slides, and friendly paddling pools. Holiday World has carousels, bowling and entertainment, and 6 miles north is Palmitos Park with its exotic gardens and parrots. At the beach you can ride camels out to the dunes and within walking distance you will find one of Gran Canaria’s most popular golf courses. There are several cosy family hotels scattered in the Maspalomas area, some with apartments and other bungalows. Slightly pacier nightlife is not offered, but Playa del Inglés is not more than about ten minutes away by bus or taxi. There you will find everything you could wish for a night out – restaurants, bars, discos and nightclubs. When should I book a late deal to Gran Canaria? For seven night package holidays, in our experience, the optimal time to book is between three and six weeks before departure. For a “build your own” flight + hotel deal booking earlier than this gets you a better deal. That said ultra last minute deals are sometimes available due to cancellations and in some cases where a tour operator changes the aircraft capacity upwards for operational reasons. If looking to book a holiday in a peak period, particularly Christmas / New Year and the February and October half term holidays, late deal bargains are rare. Even if there is availability prices tend to stay high. When are the cheapest holidays to Gran Canaria available? Whilst Christmas and New Year are always going to be expensive times to take a holiday to any of The Canary Islands, the period before Christmas can yield some great bargains. Travelling in the second week of December you can normally get a cheap holiday, top up your tan before Christmas and stock up on some duty free goodies too. Likewise a holiday in January can also be a bargain. There’s nothing wrong with Gran Canaria / Maspalomas at this time of year it’s just a low demand period as people are spent out after Christmas. The end of August is another time when you can normally grab a great late deal. 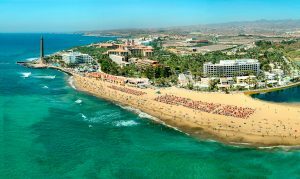 All Inclusive holidays in Gran Canaria give you an opportunity to fix the cost of the most of your holiday spending before you have even set foot on the plane. The attraction of all inclusive is that all your food, drink and snacks as well as entertainment is included in the price you pay for the hotel or package. There is quite a range of all inclusives available with a rule of thumb being “you get what you pay for”. The higher the star rating the more you will find is actually included and the less restrictions in place on the all inclusive. A flight from London to Las Palmas takes approximately four hours and a bit longer the further up the country you go so about four and half hours for Manchester to Las Palmas. 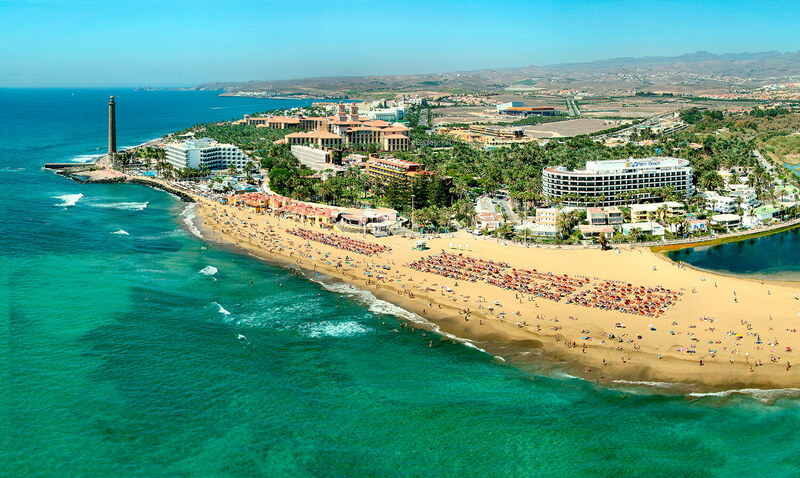 The transfer time from Gran Canaria airport to Maspalomas is normally around forty minutes. Flights to Gran Canaria are on sale now for 2020. Luckily it’s possible to get to Maspalomas from all over the UK thanks to year round flights from many airports and airlines. The main flight day from the UK to Gran Canaria is Monday but there are flights on other days too. Here are UK airports with direct flights to LPA – Gran Canaria 2019 and 2020: (some flights are seasonal). All flights are included in the Gran Canaria flight comparison. Most Popular Gran Canaria flight searches April 2019. One week Las Palmas flight from Glasgow 2019. New Year Gran Canaria flights 2020. Las Palmas from Cardiff July 2019. Cheap Gran Canaria flights departing Gatwick August 2019. Low Cost Gran Canaria flights from Manchester June 2019.